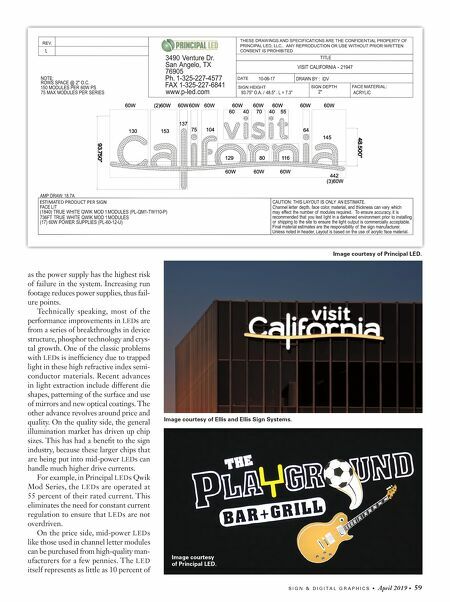 ELECTRIC SIGNAGE LED lighting has been around since the 1960s; however, it was not until the development of the white LED about 20 years ago that LED technology set itself on a path to be the dominant lighting solution of the 21st Century. LEDs are monochro- matic in and of themselves. Most white LED technol- ogy today is based upon partial conversion of blue L E D chips to white light using a phosphor. Early uses of LEDs included sig- nage, which could still use the limited output of early L E D s. Much of the L E D development over the past decade has been around efficiency improvements. Most LEDs used for sig- nage are in the low to mid power range and efficiencies of the LEDs themselves have improved from less than 100 LM/W to 150 to 200 LM/W over the past 10 years. This means that you can pull one of two levers when utilizing higher-efficiency LEDs. You can make the LED modules brighter at the same power or keep the brightness the same and run more foot- age. In signage, the name of the game is distributed light, so adding more power at some point becomes self-defeating and the sign can be too bright. Therefore, most LED module manufacturers are opting for added run footage. 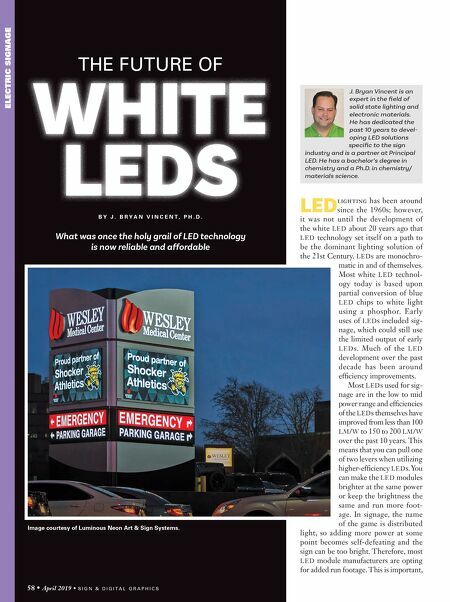 This is important, THE FUTURE OF What was once the holy grail of LED technology is now reliable and affordable B Y J . B R Y A N V I N C E N T , P H . D . J. Bryan Vincent is an expert in the field of solid state lighting and electronic materials. He has dedicated the past 10 years to devel- oping LED solutions specific to the sign industry and is a partner at Principal LED. He has a bachelor's degree in chemistry and a Ph.D. in chemistry/ materials science. WHITE LEDS 58 • April 2019 • S I G N & D I G I T A L G R A P H I C S Image courtesy of Luminous Neon Art & Sign Systems.